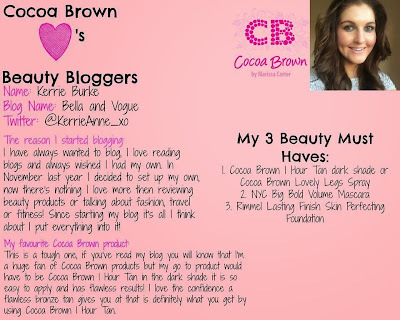 Cocoa Brown Blogger Of The Week & Giveaway Time!!! Cocoa Brown Blogger Of The Week!! Happy Friday! I am so EXCITED to announce that I am this weeks Cocoa Brown Blogger Of The Week. If you know me or have read my blog, I have posted quite a few Cocoa Brown reviews, which you can read here here and here as you can tell I am a HUGE fan so I am delighted to be Blogger Of The Week for a brand I love so much. Another reason I am so happy that this week is my blogger of the week is because I am attending a HUGE AMAZING blogger event in the G Hotel in Galway on Sunday. It is Into The West Blogger Network's 1st Birthday so it is going to be HUGE. Bloggers from all over Ireland will be attending as well as many guest speakers, brands and companies! Excitement is an understatement! I have a feeling there are a few more surprises that Sinead and Saibh haven't told us about yet so I will be doing a full blog post about the entire event and will post it next week. I will also be keeping you all updated on the day on twitter, instagram and facebook so stay tuned for that. Sinead and Saibh are the creators of the network and should be very proud of themselves after all of their success throughout the year.Well done girls! It is also my 23rd birthday on Tuesday!! So I am feeling extra generous and have decided to do a Cocoa Brown Giveaway! I am going to give two very lucky readers one Cocoa Brown Ultimate Travel Set each to celebrate the week and to thank you all for your continued support. You have no idea how much it means to me. I think the Ultimate Travel Set is the perfect gift for this time of year as a lot of people are going away on holidays, or for weekends away, as well as a lot of hen parties and weddings coming up. 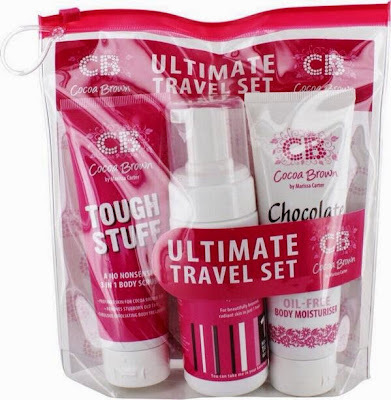 The Ultimate Travel Set contains Tough Stuff exfoliator, Chocolate Whip body moisturizer and the infamous Cocoa Brown 1hr Tanning Mousse all bottles are 100mls so you can pop them into your carry on without any hassle. *Disclaimer: You must do all of the above to be entered in this giveaway! The winner will be announced next Friday the 15th of May!